In a lot of game systems having some sort of campaign element really changes how you play the game. It becomes less about single games and more about the rise and possible fall of your budding warband/squad/group etc. The issue though is the amount of players, if you don’t have a good pool of people in the campaign it can mean that if one of you gets ahead it’s going to be pretty boring for the other player. But does it have to work like that? Let’s have a think shall we? When Mike one of my regular gaming buddies and I decided to play Songs of Blades and Heroes (SoBH) at a campaign level we knew we were going to have issues. The same two warband’s fighting against each other was going to get pretty boring and if one of us destroyed the other we had a good chance of being so powerful a game could be over before it started. You can often bring in elements to try and balance a force but to us they still felt like stop gaps and it reduced some of the gaming element. So reading a few other rules systems we came up with an idea being used by another game. NPC forces, so when we played our warband the other player would be able to use whatever they wanted to fight against us in the scenario. Because SoBH allows you to create your own forces we created a pile of profiles for our campaign world so we had them to hand. Also these random forces never gained XP and could be replaced with ease from game to game. As the aggressor it meant you didn’t care if you lost them all. As players we had to be careful because you’re playing against an opponent with nothing to lose. They’re just intent on smashing your force and winning the game at any or all costs. To also keep it interesting we rolled a D6 1-2 meant the random force had 5% less points to spend, 3-4 they had the same, 5-6 they had 5% more points to spend. The points were based on the value of the players force. So the hardest part of our campaign idea was sorted what we then needed was somewhere to play it. More often than not games that are just rules don’t always come with a campaign setting so what you do can really change the style of the game or what forces are available. Sometimes they do, but it just doesn’t fit what you want to do or you just fancy doing something different. Although I’ve been gaming for years it’s often still nice to play games in worlds I don’t know. 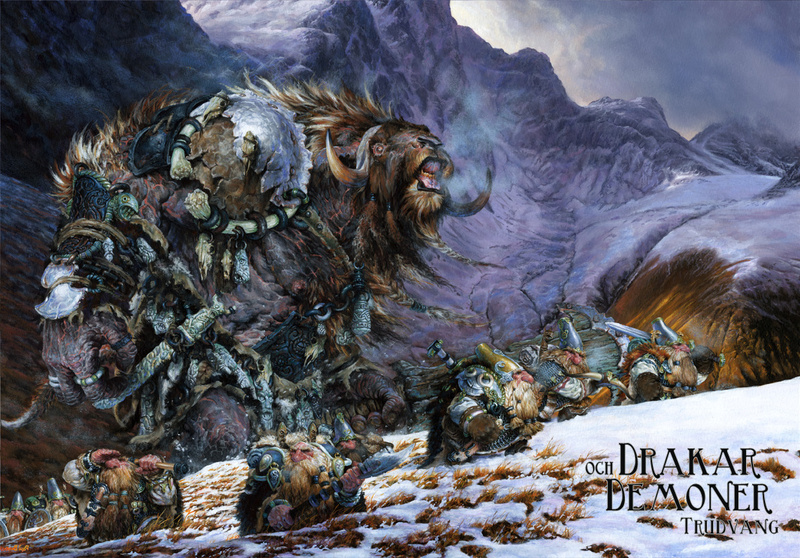 So looking around Mike found an amazing world called Trudvang which is from Riotminds Drakar och Demoner RPG (Swedish for Dragons and Demon’s). Okay so most of the source material is in Swedish and that at first was an issue, but using the internet we managed to find an English group that had translated chunks of the source material and had it freely available. We weren’t after the RPG element, just some info about the world. What it looked like and who was fighting whom. 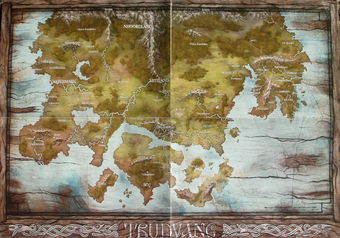 Trudvang is a world of epic battles between various warring factions, it’s a world where giant spiders fight dragons. A world where those of the same race often clash, it’s a brutal world. It’s also a world that’s had the loving attention of an amazing artist in Paul Bonner. What wasn’t to like. So Trudvang became our campaign world. We both picked Human forces to battle, mine being very much akin to Vikings and Mike’s being hillmen/barbarians. We created our starting land and off we went. Taking an idea from our Confrontation days each model had to have a universal skill as well it tied the force together and showed a common level of skill. One other thing we did was play at 15mm, we wanted the games to look epic and the forests to just deep and amazing. So 15mm really worked, the miniatures were cheap, making or getting hold of terrain was cheap. But using 28mm scale tree’s at 15mm really gave an epic scale for forests and made fighting under a canopy amazing. If a little fun try to not knock them over.